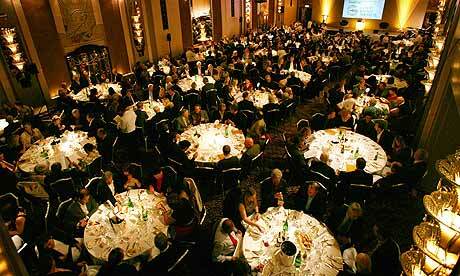 The Gold Badge awards were held in the fading opulence of the Park Lane Hotel ballroom. For 36 years the Gold Badge awards have been a low-key affair conducted behind closed doors – a quiet nod of appreciation to the unsung heroes of the recording industry. But after years of headlines about greedy executives and excessive megastars, wranglings about copyright and file-sharing, the awards organisers wanted to show another side to the music machine. More than 300 industry professionals – from producers to publicists, songwriters to arrangers – gathered in the fading opulence of the Park Lane Hotel's art deco ballroom today, with not a single A-list celebrity in sight. "For every big name, every star, there are tens if not hundreds of people working behind them; today is about celebrating those people," said Patrick Rackow, chief executive of the British Academy of Songwriters, Composers and Authors (Basca), who hosted the event. Among the award winners, one of the most instantly recognisable, if not exactly fashionable, names was that of the television presenter and singer Aled Jones – who said beforehand that he was delighted to receive an award. He did not attend today's awards gathering. "The Gold Badge awards always go to giants in the industry, so to see little old me up there with them is quite humbling," he said in a telephone interview the previous day. "It does make me feel old though – you have to have been around forever to get one." Somewhat apologetically, Lesley Douglas, a former controller of BBC Radio 2, wrote that Jones would be "forever synonymous" with his 1985 hit Walking in the Air, but was "much more" than that. Jones brushed off the reference with the resigned dignity of a man who has answered the same question for half of his life. "If I had a problem being associated with that song, I'd be in the Priory rocking backwards and forwards right now," he said. Other awards were handed out to knowing applause. The names Bill Martin and Phil Coulter may be little known outside music circles, but their songs – which include Puppet on a String, Britain's 1967 Eurovision winner, and Cliff Richard's Congratulations – are instantly hummable. With co-writer Coulter, Martin commandeered the radio waves in the 60s and 70s and wrote My Boy, Elvis's last top 20 hit before his death – although some music lovers may be loathe to forgive them for a string of hit singles created for the Bay City Rollers. Coulter described the rise and rapid fall of the pair's hit Back Home, the first football song to reach number one in the UK, in 1970. "Back Home was an exercise in opportunism," he said. "We were selling 50,000 records a day but the day after we were beaten by West Germany if you'd tried to give someone that record they'd have spat in your face." He cheerfully acknowledged that his name was unknown among "the great unwashed", but said: "When you start out as a songwriter you know you'll never be a household name. If you've got a problem with that – find another job." Another winner, guitarist Hank Marvin, who with Cliff Richard and the Shadows achieved 43 top 20 hit singles in 10 years, was saluted by Sir Tim Rice, who wrote that his Fender Stratocaster had "influenced a generation of British musicians who conquered the world". Marvin was a little more restrained. "I have no idea what the award is for, it's a mystery," he said, as the Glastonbury founder Michael Eavis shuffled past in suit and trainers. "But it's very flattering, particularly to win an award from your peers who you hope recognise talent rather than fame." Among the winners were Richard Manners, who as managing director of Island Music and then Warner helped to propel Radiohead, Massive Attack, East 17 and Bjork to fame; Gary Brooker of Procol Harum; and the former Basca chief executive Chris Green. Classical concert promoter Raymond Gubbay, violinist Tasmin Little, producer Hugh Padgham, Culture Club singer Ruby Turner, and songwriter, composer, singer and producer Robert Wyatt also received awards. The most heartfelt applause of the day was reserved for the music copyist Vic Fraser, a stalwart of the business for more than half a century. "I've been doing this for 52 years, and this is the first time someone has noticed," he said with an air of baffled pleasure. "The music business is like a clock. It is made up of lots of small pieces, and if you take just one of those pieces out, the clock doesn't work." Veteran alternative musician Robert Wyatt and Shadows guitarist Hank Marvin were among those honoured at the 36th annual Gold Badge Awards, presented in London by the British Academy of Songwriters, Composers and Authors (BASCA) in association with PRS For Music. The event, held today (Oct. 28) at London's Park Lane Hotel, celebrates contributions to the British music and entertainment industries and recognises artists, broadcasters, writers, publishers and music industry professionals. Alongside Wyatt and Marvin, new recipients of the Gold Badge of Merit included seasoned producer Hugh Padgham, English soul chanteuse Ruby Turner, songwriters Bill Martin and Phil Coulter and broadcaster and vocalist Aled Jones. Concert promoter Raymond Gubbay, classical violinist Tasmin Little, former BASCA chief executive Chris Green and Warner/Chappell Music U.K. managing director Richard Manners were also honoured, as were music copyist Vic Fraser and Procol Harum frontman Gary Brooker. Highlights of the occasion included Turner's spontaneous live rendition of I'd Rather Go Blind, and humorous speeches by, among others, Marvin and Wyatt. Marvin, who owned the U.K.'s first Fender Stratocaster, recalled how he became a guitar player after early enthusiasm for the banjo. "There's only two things worse than a banjo," he observed, "and that's two banjos." Wyatt said his advice to emerging musicians was simply to "keep going. I never had a plan, and I'm not the remotest bit competitive." He added that he felt sorry for kids on ratings-busting TV talent show "The X Factor." "Like my dad used to say," he noted, "it's real plastic." Aled Jones, meanwhile, was notable by his absence, which event host Guy Fletcher said was due to a "work commitment" and made him the first winner in the 36-year history of the event not to collect their award in person.